It can feel like summer inside even if it’s cold outside with a pitcher of these gorgeous and refreshing Spicy Grapefruit Margaritas! There really isn’t anything that can’t be improved by a good margarita, especially when we’re knee-deep in crazy cold winter weather. 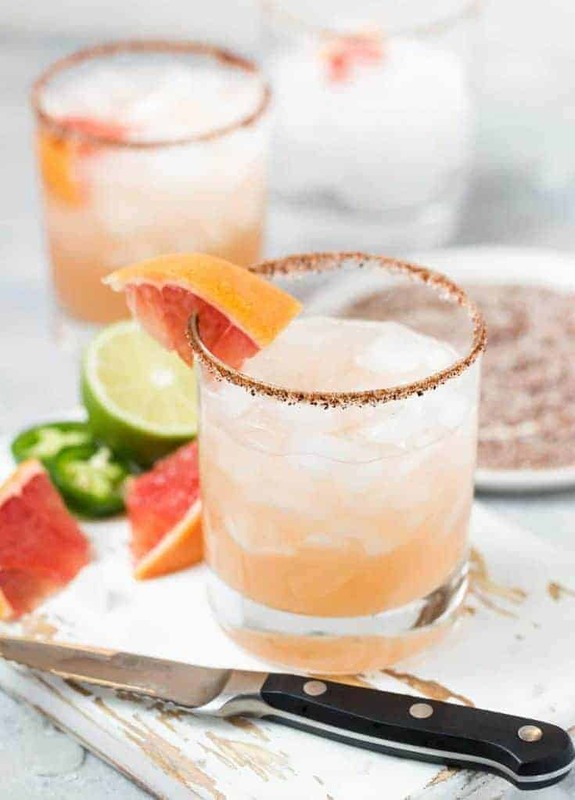 And with juicy grapefruit hitting its peak season right now, there’s no better time to whip up a batch of these Spicy Grapefruit Margaritas. It’s one of the tastiest ways I know to banish the winter blahs. 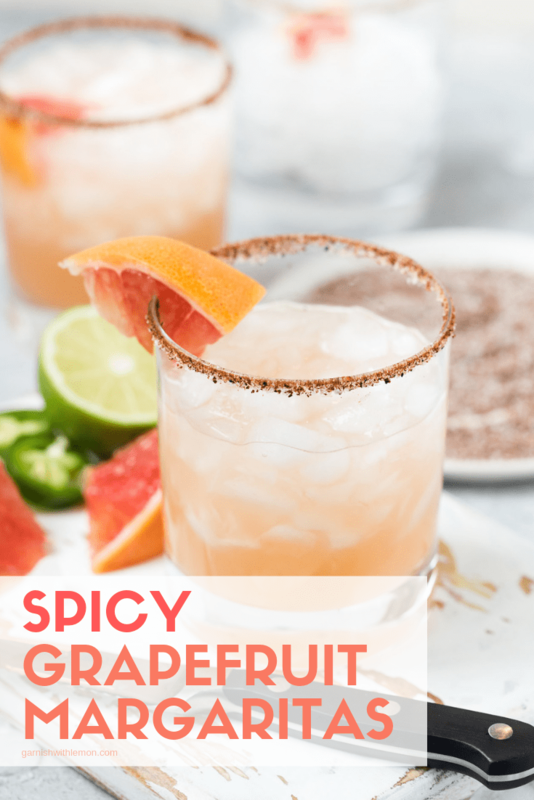 These Spicy Grapefruit Margaritas get their kick from muddling jalapeno slices to release their oils plus an irresistible sweet and salty chili powder rim. I think it’s just the right balance of heat from the peppers and chili and tang from the grapefruit and lime juices. The drink stays nice and smooth thanks to a little agave nectar for the perfect amount of sweet. Fortunately for all of those spice-averse friends out there, you can control the heat of these Spicy Grapefruit Margaritas by adding fewer jalapeno slices or skipping the chili rim entirely. Tip: Fresh grapefruit juice is the only way to go with this margarita recipe. I know it’s tempting to grab a bottled variety, but trust me; nothing beats the flavor of the fresh stuff, especially when it’s the star of this cocktail. Need a batch cocktail for your next game day party? You can make these Spicy Grapefruit Margaritas in advance just like another of our favorite citrus margs – these Blood Orange Margaritas. All that’s left to do when the game starts is give the pitcher of these pale pink beauties a quick stir. Gotta love any recipe that keeps party prep easy! 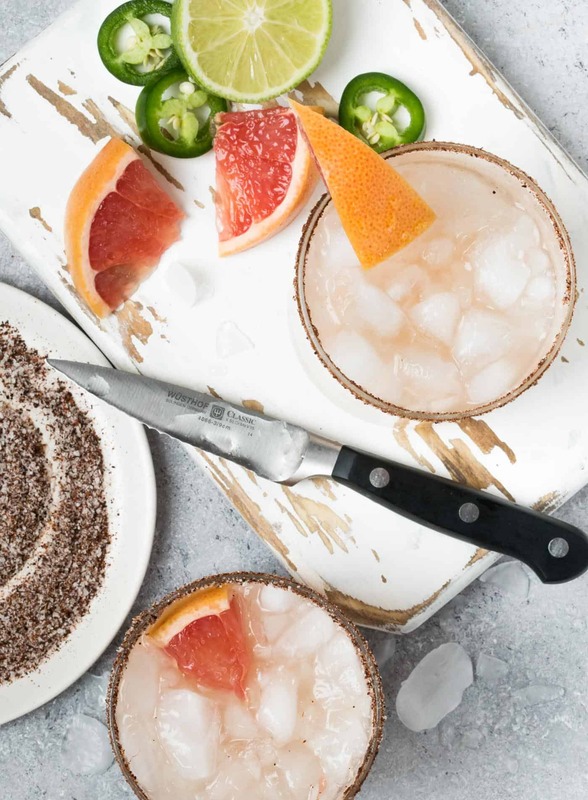 Add some color to your happy hour with these pretty-in-pink Spicy Grapefruit Margaritas. Place jalapeno slices, agave nectar and lime juice in a large pitcher. Gently muddle the jalapeno slices with the agave and lime juice. Pour in grapefruit juice and tequila. Stir until combined. Combine chili salt ingredients on a shallow plate. Rim 8 lowball glasses with juice from lime wedges and then dip the rims in the chili salt until mixture. Fill glasses with ice. Evenly divide margaritas among the 8 chili salt-rimmed glasses and serve immediately.